Published on May 9, 2010 in COP, Elections, General T&T, Media, NJAC, People's Partnership, PNM, Race and Identity and UNC. 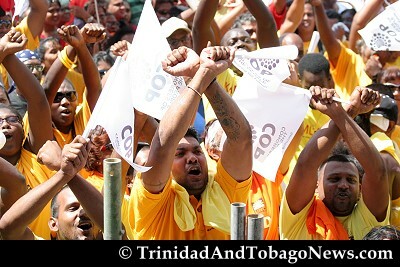 83 Comments Tags: African, Peter O'Connor, PNM Supporters, Politics, T&T Govt. Today we need to address an issue which cannot be glossed over by euphemisms and pretences. And this has less to do with some of our increasingly silly politicians, and more to do with a large segment of disillusioned voters. 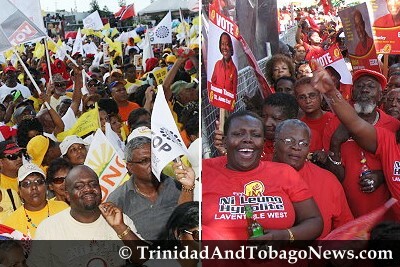 Published on May 9, 2010 in COP, Crime in T&T, Elections, General T&T, Media, People's Partnership, PNM, Politics and UNC. 6 Comments Tags: Crime in T&T, Kamla Persad-Bissessar, Patrick Manning, Politics, Raffique Shah, T&T Govt. Contrary to what over-exuberant party fanatics trumpet during and after mass meetings, crowd-attendance at most of these seasonal gatherings has been disappointing. At Couva last Thursday, for example, I arrived at the People’s Partnership (PP) in time to hear Rudy Moonilal (I believe) and Jack Warner refer to the ‘8,000 people gathered here tonight’. If there were 3,000 persons, the PP could count itself lucky.